With football, basketball, soccer and more, food and game day are a perfect pair. No matter where you’re cheering, keeping your family and friends happy with game day snacks is a big part of the experience. Putting a healthy snack on the table, however, can be difficult. Some popular game day dishes are very unhealthy, and your audience may be too busy focusing on the game to think about making smart choices. First process the garlic clove until it is finely chopped in your food processor. Add lemon juice, tahini, cumin, salt, black beans, jalapeño pepper, and crushed red pepper. When the mixture is smooth, place in a serving bowl. Drizzle olive oil over the mixture, and then sprinkle with a dash of ground red pepper. This hummus can be served with pita chips, carrots, or pretzels. To start, combine the first five ingredients a bowl. Place your beaten egg in a separate shallow bowl. Cut the width of each zucchini in half after you trim the ends. Quarter each zucchini half lengthwise to make 24 sticks. When your zucchini is ready, dip in the egg bowl; press them in the panko mixture until they are coated evenly. Cover a baking sheet with non-stick spray, and then place your zucchini on top. Coat tops of zucchini with cooking spray as well. Bake at 450° for 20 minutes or until golden brown. Dip in marinara sauce. Your guests are sure to enjoy them! Gently combine your flour, oats, baking soda and salt with a whisk. In a separate bowl beat sugar and butter until they are well blended — this can take up to three minutes. Add vanilla and egg, and continue to beat. Then you can begin to gradually add the flour mixture. When everything is blended, add strawberries and chips. Use a large spoon to drop the dough two inches apart on baking sheets coated with cooking spray. Bake at 350 degrees for about 12 minutes, or until the cookies look light brown. Cool them on wire racks when they are finished baking. 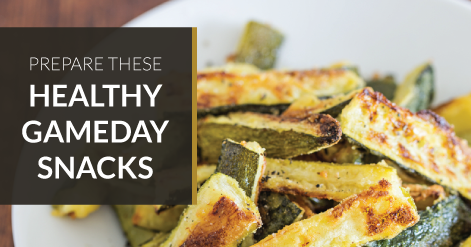 Got any other ideas for healthy game day recipes? We’d love to hear them.